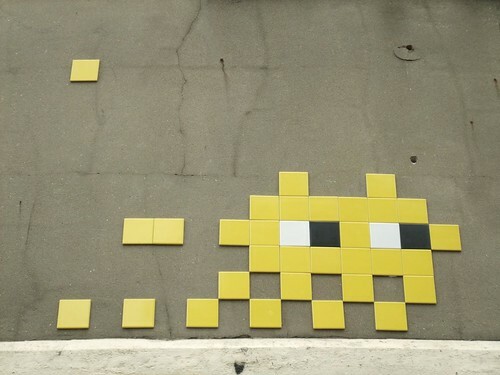 Looks like Invader managed to find some time to hit up the streets of London. Here is one of the large pieces we spotted in East London. 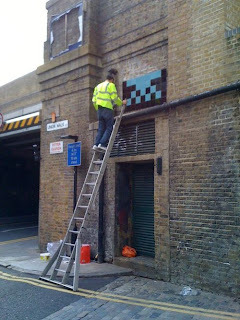 We know that there are 3 in East London that have been sighted and a new one has also been spotted on Rathbone Place, close to the Lazarides Gallery where Invaders show is taking place. 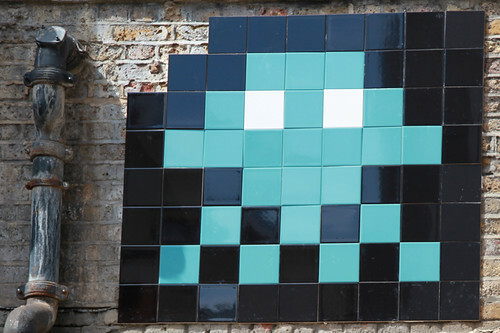 Here is another Invader piece out East captured by Mermaid99. And one last photo captured by our good friend over at Solaris100 who bumped into the man himself on the street out East while he was installing the piece pictured up top. Always interesting to see how works like these are installed. This photo also gives you an idea of the size of the piece. Keep yours eyes open and look up! The exhibition at Lazarides Rathbone will run through to the 17 September.